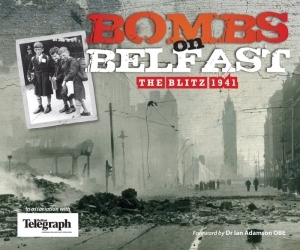 On June 1st, 2011, in the Linen Hall Library, 17 Donegall Square North, Belfast, at the request of my publishers Colourpoint Books of Newtownards, I gave a presentation on my book, Bombs on Belfast, The Blitz 1941 as part of the Library’s City in Flames:Blitz Exhibition. April 15th is a fateful day in history, for on that day in 1865 Abraham Lincoln was assassinated, on that day in 1912 the Titanic was lost, and on that day in 1941, Belfast suffered her greatest tragedy when she lost hundreds of her citizens to Nazi Bombing. In 1982 I had published, under my Pretani Press imprint, my identity of Ulster and in 1983, Colonel Paddy by Patrick Marrinan and with the proceeds of both books was able to sponsor my young friend Edmund (Eddie) Irvine into motor racing. In 1984 I published Bombs on Belfast , a Camera Record first published by the Belfast Telegraph in 1941, following the Blitz, I was also able to publish for Lady Caroline Kinahan, the wife of Sir Robin, a former Lord Mayor of Belfast, her second book, After the War Came … Peace. Sir Robin introduced me and David Campbell, who later became Chairman of the Ulster Unionist Party, to Princess Alice, Duchess of Gloucester, who is recorded in Bombs on Belfast visiting Belfast with her husband Henry just after the Blitz itself. Because of this connection we founded the Somme Association with the help of my friends Rev. Dr Ian Paisley, Eileen and Rhonda. As our President, Princess Alice rededicated the Ulster Tower at Thiepval on 1st July, 1989. David Campbell and I had the privilege of visiting her regularly at Kensington Palace until she died on 29th October, 2004. But her son, Prince Richard, quondam Earl of Ulster, has continued in the role of President of the Somme Association, both in France and Gallipoli, and to him, and to the Royal Family as a whole, we will be eternally grateful. Our Association, with its most able Director, Carol Walker, has a permanent exhibition on the Blitz at the Somme Museum, Whitespots, Newtownards and there is a Home Front Exhibition at the Northern Ireland War Memorial, Talbot Street , Belfast. We must never forget the sacrifice of those ordinary people who fought for the freedom of nations. Nor those who were buried unclaimed in the Milltown and City Cemeteries of Belfast. It is obvious that, during the Second World War, the Government of Northern Ireland lacked the will, energy and capacity to cope with a major crisis when it came. And come it did in April and May, 1941. James Craig, Lord Craigavon, who was Prime Minister of Northern Ireland since its inception in 1921, until his death on November 24, 1940, had become very frail. Richard Dawson Bates was the Home Affairs Minister. According to Sir Wilfred Spender, the cabinet secretary was “incapable of giving his responsible officers coherent directions on policy” Only Sir Basil Brooke, the Minister of Agriculture, actively pursued his duties and successfully performed with the task of making Northern Ireland a major supplier of food to Britain in her time of need. Lord Craigavon died on Sunday, 24 November 1940 and was succeeded by John Miller Andrews, then 70 years old, who was no more capable of dealing with the situation than his predecessor. The minutes of his cabinet meetings show more discussion on protecting the bronze statue of Carson than the provision of air-raid shelters and other necessities for the civil defence of the population.. Yet Dawson Bates simply refused to reply to army correspondence. When the Ministry of Home Affairs was informed by imperial defence experts that Belfast was a certain Luftwaffe target, nothing was done. Unlike other British cities, children had not been evacuated. There had been the “Hiram Plan” initiated by John MacDermott but it failed to materialise. Fewer than 4,000 women and children were evacuated but there were still 80,000 children in Belfast during the Blitz. Even the children of soldiers had not been evacuated, with calamitous results when the married quarters of Victoria barracks received a direct hit. • Die Tankstelle Conns Water…(Die) Tankstelle can mean “petrol station”. But here it probably means “Fuel Depot” or possibly “Oil Refinery”. There had already been a number of small bombings, probably by planes that missed their targets over the Clyde or the cities of the north-west of England. On 24 March 1941, John McDermott wrote to the Prime Minister, John Andrews expressing his concerns that Belfast was so poorly protected. “Up to now we have escaped attack. So had Clydeside until recently. Clydeside got its blitz during the period of the last moon. There [is] ground for thinking that the … enemy could not easily reach Belfast in force except during a period of moonlight. The period of the next moon from say the 7th to the 16th of April may well bring our turn.” Unfortunately, McDermott was proved right. The first deliberate raid took place on the night of 7 April. (Some authors count this as the second raid of four). It targeted the docks but neighbouring residential areas were also hit. William Joyce (known as “Lord Haw-Haw”), whose links with Francis Stuart have been fully documented , announced in radio broadcasts from Hamburg that there would be “Easter eggs for Belfast”. Stuart and Joyce came from similar backgrounds as “Anglo-Irishmen”, from Protestant or at least non-Catholic backgrounds who had attended school in England. In Germany, Stuart served an apprenticeship to prove his usefulness to the Germans by inter alia writing scripts for Lord Haw-Haw’s broadcasts. Finally, in August 1941, the Germans gave Stuart a broadcasting slot for himself, with the broadcasts aimed at Ireland whereas those of Lord Haw-Haw’s had been directed at Britain. By 6am, within two hours of the request for assistance, 71 firemen with 13 fire tenders from Dundalk, Drogheda, Dublin, and Dún Laoghaire were on their way to cross the Irish border to assist their Belfast colleagues. In each station volunteers were asked for, as it was beyond their normal duties. In every instance, all volunteered. They remained for three days, until they were sent back by the Northern Ireland government. By then 250 fire men from Clydeside had arrived. Another claim was that the Catholic population in general and the IRA in particular guided the bombers. Dr Barton, an expert on the Belfast Blitz, has written: “the Catholic population was much more strongly opposed to conscription, was inclined to sympathise with Germany”, “…there were suspicions that the Germans were assisted in identifying targets held by the Unionist population.” This view was probably influenced by the decision of the IRA Army Council to support Germany. But German Intelligence had been very active in the Republic of Ireland, with both the Abwehr (the German military intelligence service) and the SD (the Sicherheitsdienst, the intelligence service of the SS) sending agents there. There was a later raid on Belfast on 4 May; it was confined to the docks and shipyards. Again the Irish emergency services crossed the border, this time without waiting for an invitation. On 31 May 1941 German bombers bombed neutral Dublin. German intelligence operations effectively ended in September 1941 when An Garda Síochána made arrests on the basis of surveillance carried out on the key diplomatic legations in Ireland, including the United States. I think this was a result of the Blitzing first of Belfast and the realisation that Hitler’s intentions in the South were not so benign as de Valera had first thought. During the First World War the German objective was to roll back the borders of the Latins and return to those of a more ancient Greater Germany. Protestant Britain was to become a German colony, Catholic Ireland an Austrian one. For Hitler the Second World War was merely an attempt to clear up the unfinished business of the First.